With the temperature-boosting El Nino weather phenomenon a looming possibility, this year could see temperatures soaring to new heights, say Singapore's climate experts. "We're noting a rising temperature trend in the Pacific, especially under the ocean, so we're poised for El Nino," Dr Muhammad Eeqmal Hassim, senior research scientist at the Centre for Climate Research Singapore, told The Straits Times. "The signs are there. We just need a kick start, such as a westerly wind burst, for it to happen." In fact, in a worrying sign of things to come, the country's coolest month this decade - at 26.9 deg C - was the same temperature as the hottest month in the 1970s. Consistently above-average temperatures, though punctuated by a brief cool spell, made last year the eighth warmest year on record here. The mean annual temperature was 27.9 deg C - 0.2 deg C warmer than the year before. This despite the fact that 2018 was, in fact, hit by La Nina - which is known for bringing with it cooler temperatures - albeit a weak episode. So for last year to climb to eighth warmest on record, despite the absence of the El Nino effect, was significant. 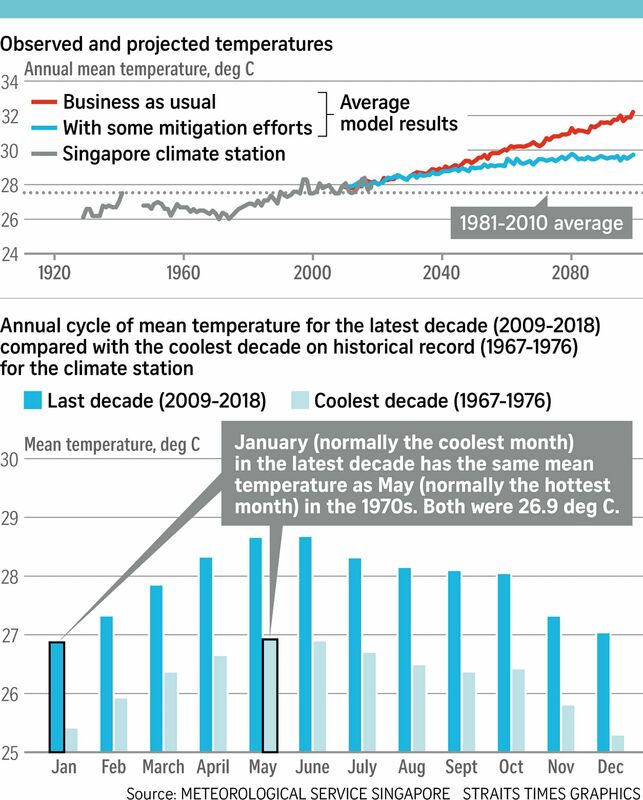 In a sign of the long-term ongoing warming in the country due to climate change and urbanisation, Singapore's top 10 warmest years have all occurred in the past 25 years, and the last 10 years (2009 to 2018) were the warmest ever. "We've shifted to a new higher temperature, and it will continue to rise," said Dr Muhammad. On its end, the Government is throwing its weight behind efforts to protect the country and provide for its survival - in the areas of water, making the most of waste, food and climate-change research. Pointing to Swedish teenager Greta Thunberg, 16, who went on a solo climate strike last August and inspired more than one million students around the globe to skip school last week in a similar protest, he said: "It's encouraging how one person with conviction can galvanise action around the world. "If everybody gets in on the act, the collective effort will make the difference."